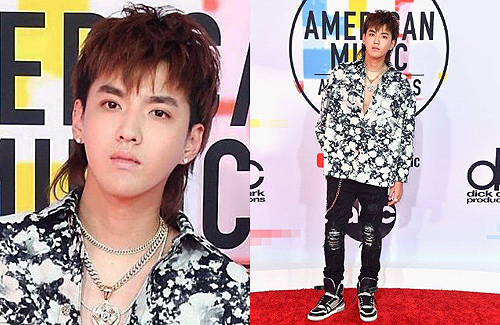 The American Music Awards 2018 <美國音樂頒獎>, held in Los Angeles on October 9, had a lot of Asian musicians walking the red carpet. Among them were former EXO Chinese-Canadian member Kris Wu (吴亦凡), NCT 127 – the subgroup of Korean boy band NCT, and former Girl’s Generation member Tiffany Young. Kris, who has been pursuing a career in the United States and signed an exclusive international record deal with Universal Music Group (UMG) earlier this year, released the MV for his hot new single “Freedom,” on the same day as his first AMAs red carpet event. The song, which features American R&B singer Jhené Aiko, had a space theme for its video with Kris and Jhené donning space suits in it. “Freedom” was first released earlier in September and it will be on Kris’ debut album, which is slated for a fall release, along with his hit single “Like That.” The singer and actor made strides in his career with “Like That” when it broke into the Billboard Hot 100, becoming the first Chinese artist to achieve that. This was also Tiffany’s AMAs red carpet debut, in which she chose to wear a Versace dress to be a “Versace rainbow princess.” Before arriving at the event, she spoke with the members of Girl’s Generation to tell them she was heading to the AMAs. “They were just like, ‘We’re so proud of you, you’re doing everything you’ve wanted, and hopefully we will go there to support you.’ So thank you for having me, and hopefully this is the first of many,” Tiffany said. As for last year’s popular K-pop guest performers, BTS, they were absent from the AMAs because they had a show in the United Kingdom. Although they did not attend the awards, they still defeated Ariana Grande, Cardi B, and Shawn Mendes by snagging the Favorite Social Artist award. i thought i was too old-school to understand the hip style. i don’t if this look would work in america. @m0m0 I don’t really care about hair or style or whatnot…what I want to know is – what’s up with that “pissed off” look? I know he’s a rapper and all and maybe he thinks looking pissed makes him look cool but honestly, it just makes him look awkward….but then again, I’m from the older generation so perhaps I just don’t understand young people’s trends and habits nowadays…. .. what do you call it? @mangotango Do you mean auto tune? Ah…it’s used in basically many American singers’ songs too. You can spot it right away with the flat pitch. @jayne I gave the vid a try and thought the song was awful with the heavy use of autotune. I scrolled down the comments on youtube and it surprised me on how many comments thinking this was amazing?? This is what people call music nowadays? @shishi yup! Lol. Music has been pretty crappy the past 10yrs. Any good songs during this period can’t stand the test of time, after a few years, they sound old and uninteresting. To be fair about this song, it’s miles better than his last song, which was so tone deaf that auto tune couldn’t even fix it! This one, the girl’s voice make it a lot better! There are many current singers that I think rubbish, but they are still around! Enough said about the current gen!